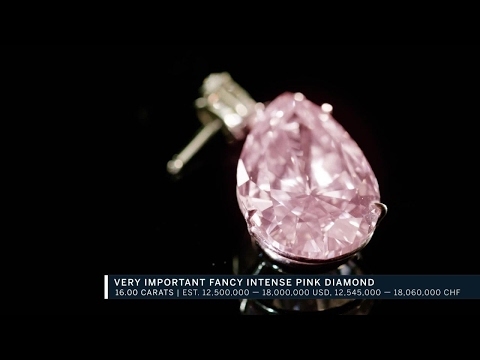 Weighing in at 18.96 carats, the Pink Legacy diamond will be the larges Fancy Vivid pink diamond ever offered at auction by Christie's when it comes up for sale on November 13, 2018 in Geneva. Graded Type IIa, a classification earned by less than 2% of diamonds, and boasting a colour and clarity typically only seen in diamonds weighing less than a carat, the Pink Legacy is descended from the Oppenheimer family and valued in the region of $30 to 50 million. The closest comparison seen at auction is the Pink Promise - a 14.93 carat Fancy Vivid pink diamond which sold at Christie's for $32.48 million in 2017. 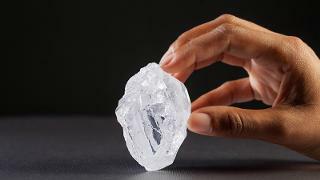 At a huge 1,109 carats, the tennis-ball sized Lesedi La Rona rough diamond was first honoured with its very own auction at Sotheby's London on June 29, 2016 but, after failing to reach its minimum, has recently been acquired by British fine jewellery house Graff in a deal valued at $53 million. Discovered in November 2015 in the Karowe mine in Botswana, it has already been certified as possessing qualities "commonly associated with Type IIa diamonds" by the Gemological Institute of America and is being hailed as the most momentous discovery since the 3,106 carat Cullinan Diamond was unearthed in 1905. Although not as large as the Cullinan, the Lesedi La Rona's composition means it has the potential to yield the world's largest top-quality diamond once it has been cut and polished. Now in the hands of one of the world's finest diamond experts, time will tell what Graff's master craftsman are able to create from this stunning stone and what treasures await potential buyers. At a huge 1,109 carats, the tennis-ball sized Lesedi La Rona rough diamond was first honoured with its very own auction at Sotheby's London on June 29, 2016 but, after failing to reach its minimum, has recently been acquired by British fine jewellery house Graff in a deal valued at $53 million. Discovered in November 2015 in the Karowe mine in Botswana, it has already been certified as possessing qualities "commonly associated with Type IIa diamonds" by the Gemological Institute of America and is being hailed as the most momentous discovery since the 3,106 carat Cullinan Diamond was unearthed in 1905. Although not as large as the Cullinan, the Lesedi La Rona's composition means it has the potential to yield the world's largest top-quality diamond once it has been cut and polished. Now in the hands of one of the world's finest diamond experts, time will tell what Graff's master craftsman are able to create from this stunning stone and what treasures await potential buyers. There are many candidates for the title of the world’s most beautiful diamond but Graff’s newly unveiled Venus is surely a contender. The largest ever flawless, D colour, heart-shaped stone at 118.78 carats, it took specially invented tools to cut it and it is worth every hour of the many months of thought and work that created it. For an object so clear and pure it has unimaginable depth and warmth. The 300-carat rough was found in June 2015 at Lesotho’s Letšeng mine, in which Graff is a major shareholder. Its superlative quality was immediately apparent and its almost cuboid, slightly pointed appearance suggested a pear-shaped or heart-shaped main stone. The latter was chosen both to avoid flaws that closer inspection revealed and to underline the romantic symbolism of this stupendous gem. After the first polish it was rated internally flawless but Laurence Graff, founder and chairman of Graff Diamonds, took the risk of asking for a second polish to attain the coveted flawless level, losing a fraction of a carat in the process. The Venus is currently unset, nestling in a beautiful wooden box. No price has yet been mentioned but it is sure to break records. And if this ultimate symbol of love is beyond your means, there are 22 satellite stones, from substantial gems of 15 or 13 carats down to modest examples of one or a half carat, in various cuts. So owning a part of the newest legendary diamond is far from an impossible dream. There are many candidates for the title of the world’s most beautiful diamond but Graff’s newly unveiled Venus is surely a contender. The largest ever flawless, D colour, heart-shaped stone at 118.78 carats, it took specially invented tools to cut it and it is worth every hour of the many months of thought and work that created it. For an object so clear and pure it has unimaginable depth and warmth. The 300-carat rough was found in June 2015 at Lesotho’s Letšeng mine, in which Graff is a major shareholder. Its superlative quality was immediately apparent and its almost cuboid, slightly pointed appearance suggested a pear-shaped or heart-shaped main stone. The latter was chosen both to avoid flaws that closer inspection revealed and to underline the romantic symbolism of this stupendous gem. After the first polish it was rated internally flawless but Laurence Graff, founder and chairman of Graff Diamonds, took the risk of asking for a second polish to attain the coveted flawless level, losing a fraction of a carat in the process. The Venus is currently unset, nestling in a beautiful wooden box. No price has yet been mentioned but it is sure to break records. And if this ultimate symbol of love is beyond your means, there are 22 satellite stones, from substantial gems of 15 or 13 carats down to modest examples of one or a half carat, in various cuts. So owning a part of the newest legendary diamond is far from an impossible dream. This incredible necklace by Hong Kong-based jewellery artist Wallace Chan brings together an entire family of flawless diamonds weighing in at a total of 383.4 carats. 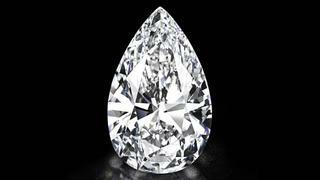 24 of the stones, including the 104 carat internally flawless centre stone, were cut from the Cullinan Heritage - a 507.55 carat rough diamond bought by retail jeweller Chow Tai Fook for $35.3 million in 2010. The necklace itself represents 47,000 hours of work and features pink diamonds, green jadeite and white jade in ornate forms including a bat for good luck and butterflies for eternal love. As if that wasn't spectacular enough, the modular design of the necklace means it can be worn in 27 different ways making it the ultimate transformer jewel for your capsule collection. This incredible necklace by Hong Kong-based jewellery artist Wallace Chan brings together an entire family of flawless diamonds weighing in at a total of 383.4 carats. 24 of the stones, including the 104 carat internally flawless centre stone, were cut from the Cullinan Heritage - a 507.55 carat rough diamond bought by retail jeweller Chow Tai Fook for $35.3 million in 2010. The necklace itself represents 47,000 hours of work and features pink diamonds, green jadeite and white jade in ornate forms including a bat for good luck and butterflies for eternal love. As if that wasn't spectacular enough, the modular design of the necklace means it can be worn in 27 different ways making it the ultimate transformer jewel for your capsule collection. One of the newest diamond to join the elite handful of top ranking rare diamonds is Graff’s Golden Empress. The Fancy Intense cushion cut yellow diamond weighs in at 132.55 carats and was cut from a 299 carat opaque diamond discovered in Lethoso. The rough diamond also yielded six pear-shaped and two brilliant round satellite diamonds. Unveiled earlier this year, the Golden Empress is available for bespoke creations or as part of a necklace set with 30 other yellow diamonds, making it a truly unique and covetable piece from this purveyor of the world’s finest gems. One of the newest diamond to join the elite handful of top ranking rare diamonds is Graff’s Golden Empress. The Fancy Intense cushion cut yellow diamond weighs in at 132.55 carats and was cut from a 299 carat opaque diamond discovered in Lethoso. The rough diamond also yielded six pear-shaped and two brilliant round satellite diamonds. Unveiled earlier this year, the Golden Empress is available for bespoke creations or as part of a necklace set with 30 other yellow diamonds, making it a truly unique and covetable piece from this purveyor of the world’s finest gems. Unveiled as the centrepiece of De Beer’s 1999 Millennium Diamonds collection, this incredible 203.04 carat diamond is the world’s second-largest grade D (top colour) flawless diamond after the privately owned Centenary Diamond. The stone, which is cut from a 777 carat diamond discovered in Congo in 1990, was so famous that within weeks of it going on display at the Millennium Dome an attempt to steal it during a jewellery heist was foiled by the Metropolitan Police. The stone remains unsold because, despite having an estimated carat-weight value of $5 million, De Beers insists that the stone’s rarity, clarity and irreplaceability make all talk of monetary value irrelevant. However, for the right price, we think they could be persuaded. Unveiled as the centrepiece of De Beer’s 1999 Millennium Diamonds collection, this incredible 203.04 carat diamond is the world’s second-largest grade D (top colour) flawless diamond after the privately owned Centenary Diamond. The stone, which is cut from a 777 carat diamond discovered in Congo in 1990, was so famous that within weeks of it going on display at the Millennium Dome an attempt to steal it during a jewellery heist was foiled by the Metropolitan Police. The stone remains unsold because, despite having an estimated carat-weight value of $5 million, De Beers insists that the stone’s rarity, clarity and irreplaceability make all talk of monetary value irrelevant. However, for the right price, we think they could be persuaded. 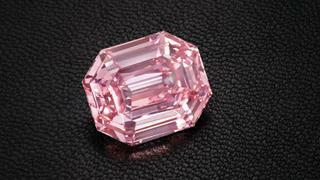 While much smaller than its colourless and yellow counterparts, at 23.88 carats the Graff Pink is undeniably one of the rarest and most desirable stones in existence. Bought for £29 million as a rough 24.78 carat stone from a private collector in 2010, Laurence Graff set about removing 25 natural flaws from one of the few truly pink diamonds to exceed five carats. After painstakingly removing less than one carat, the end result was an internally flawless and vivid stone that has been certified as one of the largest and most valuable pink diamonds in the world. At 407.48 carats this yellow-brown stone is one of the largest diamonds in existence and has an equally astonishing history to match. Discovered among a pile of a rubble by a young Congolese girl in 1989, the 890 carat rough stone was sold by her uncle to De Beers before passing into the hands of diamond dealers Donald Zale, Louis Glick and Marvin Samuels. After a brief spell on display at the Smithsonian, Samuels cut the stone into one large “triolette” centrepiece and 14 satellite stones. Louis Glick offered the stone for auction at Christie’s in 1988 but the lot was withdrawn when it failed to reach the reserve price of $20 million – at least $8.5 million more than had ever been bid for a single stone. In 2002 Glick tried his luck on eBay but, at $15 million, the lot failed to gain any interest. 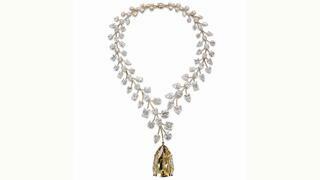 Eventually it passed to Mouawad Jewellery who used the diamond as the centrepiece of its currently unsold L’Incomparable necklace which, with a price tag of $55 million, set a new world record as the world's most expensive necklace. At 407.48 carats this yellow-brown stone is one of the largest diamonds in existence and has an equally astonishing history to match. Discovered among a pile of a rubble by a young Congolese girl in 1989, the 890 carat rough stone was sold by her uncle to De Beers before passing into the hands of diamond dealers Donald Zale, Louis Glick and Marvin Samuels. After a brief spell on display at the Smithsonian, Samuels cut the stone into one large “triolette” centrepiece and 14 satellite stones. Louis Glick offered the stone for auction at Christie’s in 1988 but the lot was withdrawn when it failed to reach the reserve price of $20 million – at least $8.5 million more than had ever been bid for a single stone. In 2002 Glick tried his luck on eBay but, at $15 million, the lot failed to gain any interest. 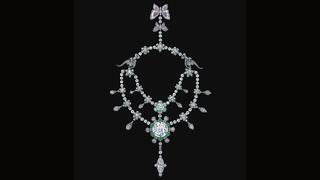 Eventually it passed to Mouawad Jewellery who used the diamond as the centrepiece of its currently unsold L’Incomparable necklace which, with a price tag of $55 million, set a new world record as the world's most expensive necklace. As if further proof was needed of Graff’s dealings with some of the world’s most exquisite diamonds, the third stone in our list to be in the company's possession is the Wittelsbach-Graff. An exceptionally rare 31.06 carat internally flawless deep blue stone, it originated in the Kollur mines of Andhara Pradesh and first belonged to King Philip IV of Spain for inclusion in his daughter’s dowry. It was bought by Laurence Graff in 2008 for £16.4 million and has been displayed at both The Smithsonian and Natural History Museum of New York. The De Grisogono flawless diamond sold at auction in November 2017 for $33.7 million. To celebrate its 25th anniversary, Geneva-based fine jewellery house De Grisogono is partnering with Christie's to offer the largest flawless D-colour diamond ever to come to auction. Weighing in at a huge 163.41 carats, the IIA type diamond was cut from a 404 carat rough discovered in the Lulo mine in Angola in February 2016 and took 11 months to cut and polish into the final dazzling emerald-cut stone. The diamond is currently set as the centrepiece of an asymmetric necklace featuring a further 18 diamonds and two rows of pear-cut emeralds which took 14 craftsmen around 1,700 hours to create. The necklace, whose estimated price is as-yet undisclosed, will be auctioned as the star lot of Christie's Magnificent Jewels sale in Geneva on November 14, 2017 while the Art of De Grisogono partnership will see a number of other important stones from the house be offered throughout Christie's Autumn season. The De Grisogono flawless diamond sold at auction in November 2017 for $33.7 million. To celebrate its 25th anniversary, Geneva-based fine jewellery house De Grisogono is partnering with Christie's to offer the largest flawless D-colour diamond ever to come to auction. Weighing in at a huge 163.41 carats, the IIA type diamond was cut from a 404 carat rough discovered in the Lulo mine in Angola in February 2016 and took 11 months to cut and polish into the final dazzling emerald-cut stone. The diamond is currently set as the centrepiece of an asymmetric necklace featuring a further 18 diamonds and two rows of pear-cut emeralds which took 14 craftsmen around 1,700 hours to create. The necklace, whose estimated price is as-yet undisclosed, will be auctioned as the star lot of Christie's Magnificent Jewels sale in Geneva on November 14, 2017 while the Art of De Grisogono partnership will see a number of other important stones from the house be offered throughout Christie's Autumn season. 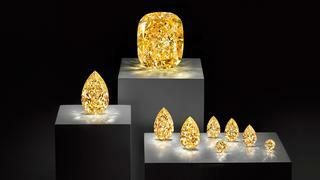 The Artemis and Apollo diamonds sold at auction with a final price of £44.9 million. A pair of coloured diamonds are set to go under the hammer at Sotheby's Geneva in May 2017 which could break records for the most expensive earrings ever sold. The Apollo and Artemis diamonds, named for the brother and sister gods of power and beauty in Greek mythology, are currently set as a pair of earrings but will be sold separately due to their outstanding quality and value. The star of the two is Apollo, a 14.54 carat Fancy Vivid Blue diamond valued at $40 million, while its sibling is classed as a 16 carat Fancy Intense Pink diamond with a value of $14.5 million. Both are pear-cuts and, if sold to separate buyers, will likely be reset by their new owners. 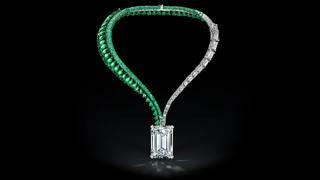 The Artemis and Apollo diamonds sold at auction with a final price of £44.9 million. A pair of coloured diamonds are set to go under the hammer at Sotheby's Geneva in May 2017 which could break records for the most expensive earrings ever sold. The Apollo and Artemis diamonds, named for the brother and sister gods of power and beauty in Greek mythology, are currently set as a pair of earrings but will be sold separately due to their outstanding quality and value. The star of the two is Apollo, a 14.54 carat Fancy Vivid Blue diamond valued at $40 million, while its sibling is classed as a 16 carat Fancy Intense Pink diamond with a value of $14.5 million. Both are pear-cuts and, if sold to separate buyers, will likely be reset by their new owners. 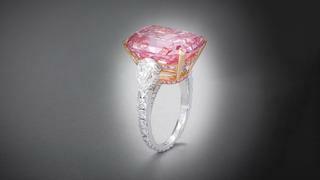 The Pink Star diamond sold at auction at Sotheby's reaching $71.2 million. The world's largest Internally Flawless Fancy Vivid pink diamond is set to go under the hammer at Sotheby's Hong Kong on April 4 and, with an estimate in excess of $60 million, may become the most expensive diamond ever sold at auction. The Pink Star was cut from a 132.5 carat rough diamond unearthed in Africa by De Beers in 1999 and took two years to cut and polish into a beautiful oval form which highlights the rare internal clarity and chemical purity of the stone. The Pink Star was previously offered for sale at Sotheby's Geneva in 2013, where it reached $83 million, but the buyer defaulted on the payment leaving the stone unsold and the title of most expensive diamond in the hands of the Oppenheimer Blue which went for $57.5 million at Christie's Geneva in 2016. 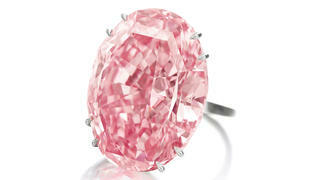 The Pink Star diamond sold at auction at Sotheby's reaching $71.2 million. The world's largest Internally Flawless Fancy Vivid pink diamond is set to go under the hammer at Sotheby's Hong Kong on April 4 and, with an estimate in excess of $60 million, may become the most expensive diamond ever sold at auction. The Pink Star was cut from a 132.5 carat rough diamond unearthed in Africa by De Beers in 1999 and took two years to cut and polish into a beautiful oval form which highlights the rare internal clarity and chemical purity of the stone. The Pink Star was previously offered for sale at Sotheby's Geneva in 2013, where it reached $83 million, but the buyer defaulted on the payment leaving the stone unsold and the title of most expensive diamond in the hands of the Oppenheimer Blue which went for $57.5 million at Christie's Geneva in 2016. The Unique Pink diamond sold for $28 million at Sotheby's on May 17, 2016. Weighing in at 15.38 carats, the Unique Pink is the largest Fancy Vivid pink pear-shaped diamond ever offered at auction. Recently cut and mounted as a ring by Cora International, the gem went on sale as part of Sotheby's Magnificent Jewels and Noble Jewels sale in Geneva on May 17, 2016. Less than 5% of all diamonds are classified as true coloured diamonds and the Unique Pink is particularly special for its Type IIa certification - the most chemically pure class of diamond - from the Gemological Institute of America. As well as owning this incredibly rare stone, the new owner will also be able to rename it thus memorialising their purchase for posterity. The Unique Pink diamond sold for $28 million at Sotheby's on May 17, 2016. Weighing in at 15.38 carats, the Unique Pink is the largest Fancy Vivid pink pear-shaped diamond ever offered at auction. Recently cut and mounted as a ring by Cora International, the gem went on sale as part of Sotheby's Magnificent Jewels and Noble Jewels sale in Geneva on May 17, 2016. Less than 5% of all diamonds are classified as true coloured diamonds and the Unique Pink is particularly special for its Type IIa certification - the most chemically pure class of diamond - from the Gemological Institute of America. As well as owning this incredibly rare stone, the new owner will also be able to rename it thus memorialising their purchase for posterity. 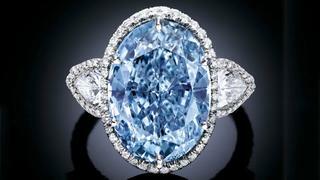 The Oppenheimer blue diamond has now been sold at auction reaching $57.5 million. 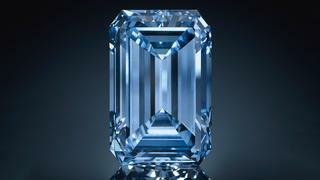 One of there rarest gems in the world, the Oppenheimer diamond became the largest Vivid Blue diamond ever to appear at auction when it went under the hammer at Christie's Magnificent Jewels sale in Geneva on May 18, 2016. Named for its previous owner and diamond connoisseur Sir Phillip Oppenheimer, this 14.62 carat rectangular-cut stone was accompanied by its original platinum mounting and a monograph from the Gemological Institute of America attesting its rarity, provenance and clarity. The Oppenheimer blue diamond smashed its estimate of $38 - 45 million, eventually selling for $57.5 million, thus breaking records for the most expensive blue diamond ever sold. 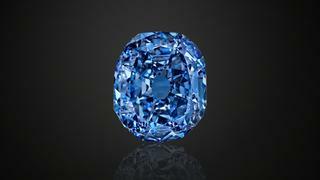 The Oppenheimer blue diamond has now been sold at auction reaching $57.5 million. One of there rarest gems in the world, the Oppenheimer diamond became the largest Vivid Blue diamond ever to appear at auction when it went under the hammer at Christie's Magnificent Jewels sale in Geneva on May 18, 2016. Named for its previous owner and diamond connoisseur Sir Phillip Oppenheimer, this 14.62 carat rectangular-cut stone was accompanied by its original platinum mounting and a monograph from the Gemological Institute of America attesting its rarity, provenance and clarity. The Oppenheimer blue diamond smashed its estimate of $38 - 45 million, eventually selling for $57.5 million, thus breaking records for the most expensive blue diamond ever sold. 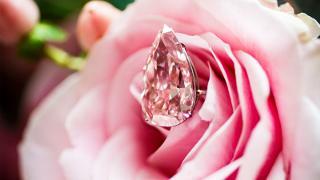 The De Beers Millennium Jewel 4 has now been auctioned, reaching a sale price of $32 million. This 10.10 carat, Internally Flawless, Fancy Vivid blue diamond is the largest oval blue diamond ever to appear for auction and is set be sold by Sotheby's Hong Kong on April 5, 2016. As the name suggests, it was part of the De Beers Millennium Jewels collection, comprising 10 rare blue diamond and one 203.4 carat white diamond (the Millennium Star - also in this list) which were displayed at the Millennium Dome and the subject of a consequent attempted jewellery heist. The Millennium Jewel 4 is only the second diamond from the collection to be offered on the open market and, while it is unlikely to surpass the Blue Moon of Josephine which fetched $48.4 million in November 2015, estimates currently stand at a noteworthy $30-35 million. 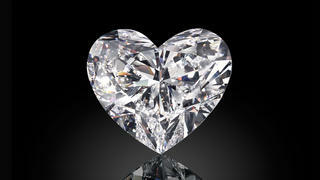 The De Beers Millennium Jewel 4 has now been auctioned, reaching a sale price of $32 million. This 10.10 carat, Internally Flawless, Fancy Vivid blue diamond is the largest oval blue diamond ever to appear for auction and is set be sold by Sotheby's Hong Kong on April 5, 2016. As the name suggests, it was part of the De Beers Millennium Jewels collection, comprising 10 rare blue diamond and one 203.4 carat white diamond (the Millennium Star - also in this list) which were displayed at the Millennium Dome and the subject of a consequent attempted jewellery heist. The Millennium Jewel 4 is only the second diamond from the collection to be offered on the open market and, while it is unlikely to surpass the Blue Moon of Josephine which fetched $48.4 million in November 2015, estimates currently stand at a noteworthy $30-35 million.